It is also very uncommon that a company wouldn't have deployed VoIP at some level. The most common scenario is having an office with fancy IP Phones pointing to a local PBX; the PBX usually is plugged into an E2 trunk or a SIP trunk for international calls. How do You Save Money While Keeping Your Employees Connected? What most companies ignore is they can cut those expensive cell phone "all included" packages with a correct DISA deployment. Most common DISA application case is the calling card. We are not going to discuss calling cards, it is just a reference to understand what is DISA. The given employee will dial a local company number. Depending on the company's policy, the employee may identify himself by a double pin or by using the caller id number (also known as pin-less). The PBX then will ask for the phone number and it will connect both ends. The company does not need to dial a long-distance number (just local). Even if the employee lives in a different city from the company, renting a local DID number is far cheaper than paying long distance calls. The PBX then, with fixed dial plans or dynamic routing such as LCR may decide how to route the call. 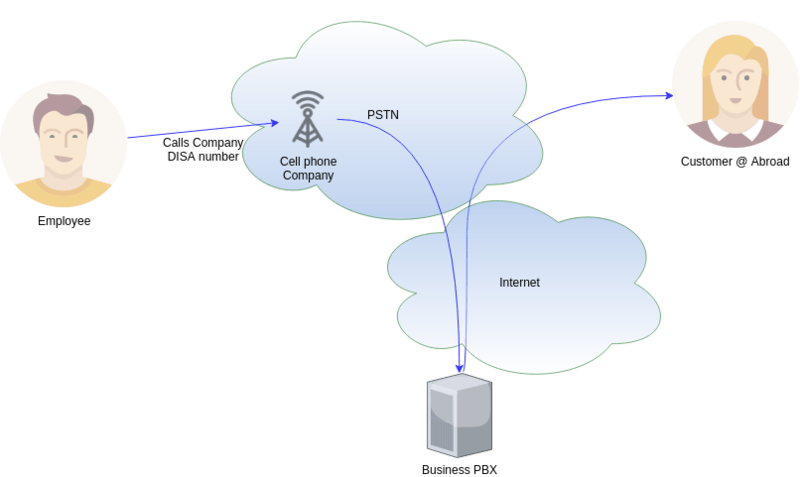 This example assumes the PBX has a SIP trunk, but there are multiple scenarios. Some Internet SIP carriers give a fair quality service with rates from 0.003 USD per minute to US48 and Canada. I want to save that money, What should I do? First of all, you will need to have a PBX for that. If you don't, OKay can provide affordable PBX'es that will fit your needs. You will need as well to get from a reputable VoIP carrier DID's of the cities your employees live. The cost of this may vary depending on the city (from some cents to few dollars). And third, you will need an affordable carrier with fair prices to the cities your customers are. Again, this could be from less than a cent (some US cities) to few dollars (Antartica and exotic destinations) per minute. You can always contact OKay for more information.